Dr. Judd Rice is an Assistant Professor of Biochemistry and Molecular Biology at the USC Keck School of Medicine and the USC/Norris Comprehensive Cancer Center. ​Judd received his Bachelors of Science degree at the University of Arizona in Molecular and Cellular Biology in 1993. After working as a laboratory technician for Dr. Andrea Yool for two years, he entered the Ph.D. program in Pharmacology and Toxicology at the University of Arizona where he trained under Dr. Bernard Futscher. Following his graduation in 2000, Judd became an NIH NRSA-supported post-doctoral fellow for Dr. David Allis at the University of Virginia. 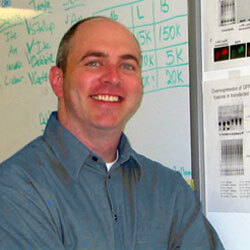 In November 2003, Judd became an Assistant Professor of Biochemistry and Molecular Biology at USC. The following year, Judd won the General Motors Cancer Research Scholar Award and, in 2006, he was named a Pew Scholar in the Biomedical Sciences. His extracurricular activities include playing rugby football with the Pasadena Rugby Football Club. Outside the Box: Five cancer-fighting experts go beyond scientific boundaries to take innovative cancer research and patient care in new directions. Histone Methylation: new insights into epigenetic gene regulation. Streaming video of Judd's talk for the Univesity of Arizona College of Medicine Cancer Biology Seminar Series. RealPlayer or Windows Media Player required to view.